So, a few weeks ago I won a giveaway from a fellow blogger, Along Comes Mary! 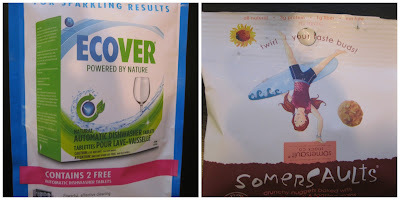 I won three months of home delivery from Conscious Box, which is a monthly mail order program that sends a box packed full of healthy and earth-friendly goodies! Even the actual Box is made from 100% recycled materials, Ink from veggies, and a BPA-Free label. It is such a great, and super fun!, way to discover new healthful food, beauty, and home products. I couldn't wait to open my package, when it arrived!! This package was filled with tea, seasoning salt, an electrolyte powdered drink, granola-type snacks, a couple relaxation items: a tea and drink, all natural toothpaste and sunscreen, and dishwasher detergent. I love the Gatorade alternative of the electrolyte drink, Ultima Replenisher. It is more healthful and tastes great! It contains no artificial sugars or food coloring; only natural, replenishing ingredients and a bit of stevia. This Earthpaste toothpaste by Redmond Trading Company is made from natural clay and salt, with essential oils. "Food Grade Redmond Clay® is a polishing cleanser with antibacterial properties that has been used for centuries to promote digestive health." At first, it is super weird to use a toothpaste without that well-known foaming agent added, and without the bright white or blue artificial coloring. But the wintergreen taste is refreshing, and it seems to do its job just as well as any other common toothpaste. It is also 100% safe to swallow, so is great for kids, as well. They even make an especially kid friendly lemonade flavor. I am really excited to try these dishwashing detergent tabs, and I have been researching (read: Pinterest) how to make your own organic and natural dish soap lately and this seems much more natural than my current brand. I also can't wait to try out this natural sunscreen this summer! Mainstream sunblock always seems SO full of chemicals. 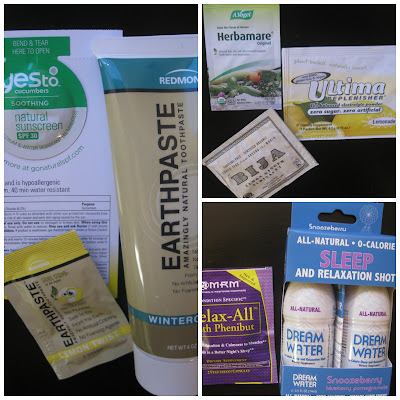 I wish there were a couple more food items to try out, but overall I was super impressed with this company and get to be exposed to all these natural and interesting products in a convenient sample size! Thanks Conscious Box & Along Comes Mary! !